Erma Lee is on the run. Running from an abusive husband. Running from a mother who doesn’t care – never cared. Running from a soul-numbing factory job that embodies a spirit that has held her down her entire life. 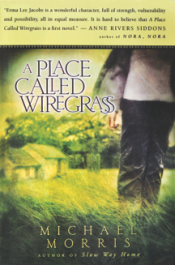 She and her granddaughter, Cher, flee to the town of Wiregrass, Alabama, where she can escape her past and start over – or so Erma Lee thinks. In Wiregrass, Erma Lee forms an unlikely friendship with Miss Claudia, an elderly socialite who is hiding a few details about her own past. Life in the small Alabama town is different, merciful and promising. Promising, until the day Cher’s convict father arrives in town and then all three women must come to terms with buried secrets.